Bicardi first came to our family as a kitten via my niece Laurie. Even then he was very adventuresome which became evident when she hoped to keep him an indoor kitty and he had other plans. At the time she had an infant as well and only decided to give him to her grandmother after finding him in the crib with her baby not once but twice. The second time he was busy removing burrs from his under coat and literally tossing them all around the baby in the crib. With a heavy heart she knew she would have to let him go. Laurie was happy that she could still play with Bicardi and see him grow into one handsome cat whenever she visited her grandmother. 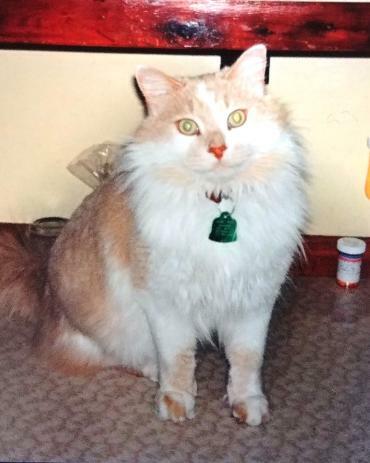 Bicardi was a cat that could jump AMAZING heights which gave him an advantage on his nightly outdoor adventures. 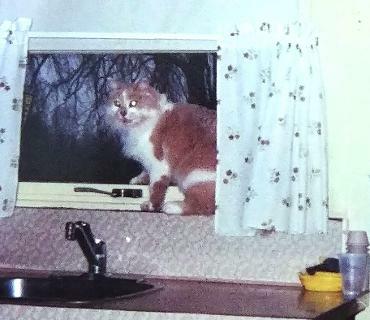 The photo below captures him waiting by the window, his door to the outside. In fact it looks like he could almost open it himself if his Mom took too long to let him out. While he had certain areas of the house he was not allowed and specific spots he was allowed to sleep (always on one of his Mom's sweaters spread out on the bed), he had lots of fun investigating any bags or boxes she brought home, often having more joy from jumping in and on the bags than what was in them. Though out the years he could b unpredictable with anyone wanting to give him affection, even his Mom. You never quite knew when petting him if he was going to grab your hand with claws out, give you a "love" bite or just lay there and enjoy it, loving every minute of the attention being bestowed upon him. Whenever I visited he would sleep on one of Mom's sweaters on my bed after investigating any luggage or bags I had brought from home with me..
Bicardi, having become very sick overdoing it with warm milk when he was a kitten, would only drink cold milk / food as an adult. So any left overs remained leftovers until they were thrown out. That didn't stop him from catching and eating a warm mouse when on a hunt. When my Mom became too sick to take care of him in this way my Sister tried tricking him by putting the leftovers in the fridge right away. It worked! He happily ate and drank it up leaving his plate the empty for the first time. She continued to do this until he joined his Mom in heaven not long after she succumbed to cancer. I can still see Handsome Bicardi prancing around Mom's house with his tail straight up, checking out anything he thought needed investigating while he was either outside or having a nap. We miss YOU Bicardi! the only comfort is in trusting that You are with our Mom/Grandmother giving each other as much love and joy as when you both were here on earth with us.